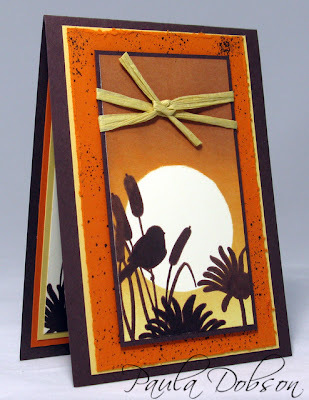 Paula, your card is absolutely "jaw dropping" STUNNING! The colours & textures are perfect, & the silhouetted imagery looks fantastic. Gorgeous and totally inspiring as always! I love this Stamp Set also. Gorgeous Paula. Those colours are fabulous. WOW Paula, this is absolutely stunning. I love the silhouette and the colours are gorgeous. WOW...this is a gorgeous card Paula. You have every right to be thrilled. I love the colours, the brayered sunset and the silhouette...the combined effect is just stunning. The raffia is also a beautiful additional element!